Camstudio Free Download and record your PC screen activity. It is used for desktop activity capturing to make tutorials. Camstudio Free Download in single link. 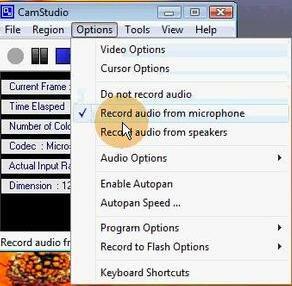 CamStudio is a screen casting program for Windows. It is a free software. Camstudio renders videos in an AVI format. 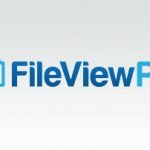 It can also convert these AVIs into FLV format, embedded in SWF file. If anyone needs to show some interactive illustration of his work and want to show the user how to use an application on a program Camstudio is an excellent solution. Camstudio is a wonderful choice for the people who have to provide technical support or for the developers who have to made tutorials to explain how to use their programs. The output files range is limited. CamStudio only gives output in AVI format but one can also convert movies to Flash (SWF). 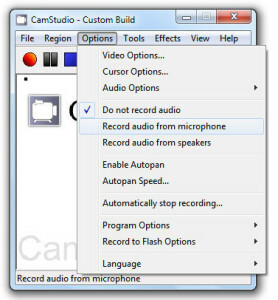 CamStudio allows you different options when it comes to the region of your screen being recorded. 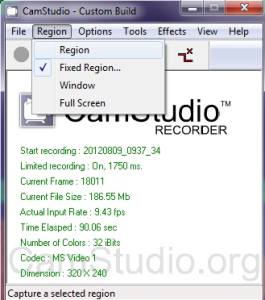 First of all Choose “Region” from the Region drop-down menu and upon clicking Record, you will be able to draw out the square area you would like to see recorded. 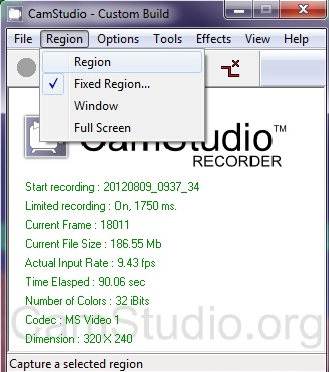 Choose “Fixed Region” and you will be able to record desired screen area. For whole screen recording Choose “Full Screen”. 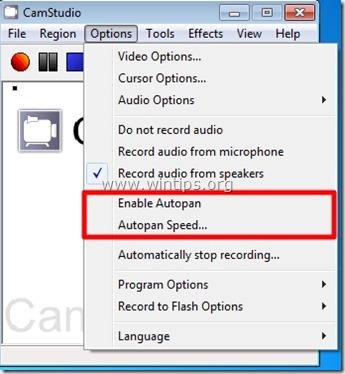 There is also an Autopan option which will allow the recording area to follow the cursor. Smaller screen area can be recorded effectively on what you are working on by using this option. 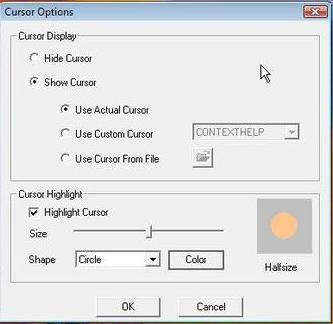 While creating screencasts there is sometimes a difficulty to see the mouse cursor. CamStudio comes with some options to tackle this issue. As you can see in the screenshot above, you have several options such as using a custom cursor, highlighting the cursor, and hiding the cursor. 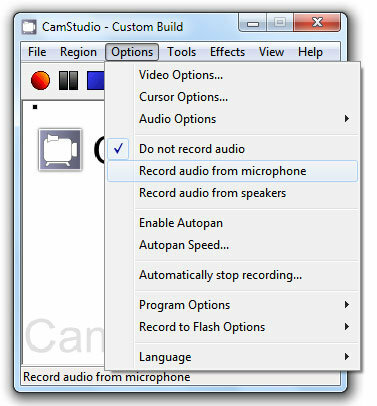 Camstudio offers several options related to the audio. You can choose to either record your voice via microphone or record the sound coming from your computer however If you are intending to add some kind of audio later on, you can choose to not record any audio. Under the tools menu there is an option for screen annotations. Choose something from the list that appeared and double click it. 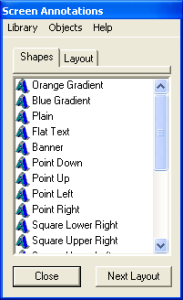 Right clicking on the balloon, cloud, etc some options such as edit text, edit image, edit transparency and resize are given. The annotations can be saved and cloned. 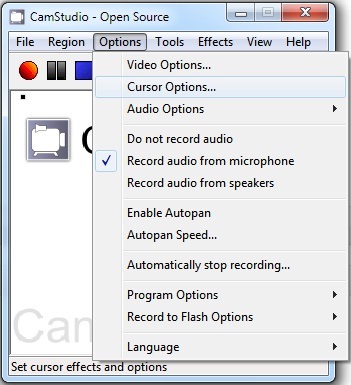 If you want to add the annotation to your screencast, just pause the recording, go to the annotation you have saved and place it whereever you want it, and than continue recording until you want it to disappear. Below are wonderful features. You can see these live after Camstudio Free Download. 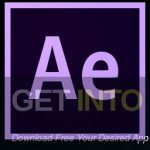 Creates demo videos for any software program. Creates video tutorials for college and university lectures. Record repeating problems with your computer so you can show technical support to people. Create video-based information of products you want to sell. Records new tricks and techniques you discover on your favorite software program, before you forget them. Before you start Camstudio Free Download make sure that you system meets the minimum system requirements. Hard Disk Space: 4MB of Hard disk space required for installation. Click on below button to start Camstudio download. This is complete offline installer and full standalone setup for Camstudio. This will work for both 32 Bit and 64 Bit operating systems. 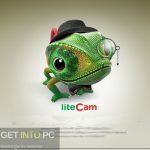 This is camstudio free downlaod for all windows 8, 7 or XP.